Andrew Noordhoff is a Year 4 teacher who, since 2016, has been involved in reSolve: Mathematics by Inquiry ­– a national program from the Australian Association of Maths Teachers (AAMT) and Australian Academy of Science, which aims to encourage more relevant and engaging mathematics for F-10 students. He’s one of over 250 reSolve Champions working to drive inquiry-based Mathematic learning in their schools and in today’s article, he discusses how students responded to their most recent reSolve lesson sequence. Over the past twelve months as a reSolve ‘Champion’ I’ve been working with staff to run reSolve lesson sequences in our classrooms. 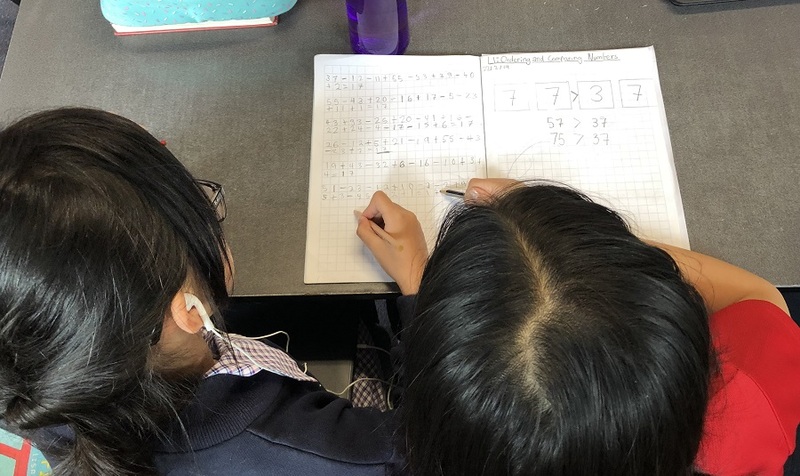 My journey with ‘reSolve: Maths by Inquiry’ started when I attended a workshop about it at a Maths Association of Victoria (MAV) Conference in 2016. At the conclusion of the workshop we were told they were looking for people to apply to become Champions for the program and help embed the lessons in schools. With the support of my principal, I applied and my journey as a Champion began. My school, Jells Park Primary School, has an excellent reputation for Maths. We were accepted as a Maths Active School by MAV and are regularly one of the best performing schools at the Maths Talent Quest (a competition run by MAV). However, we do not rest on this and adding reSolve to our curriculum was welcomed. My teaching partner and I recently team taught another reSolve lesson sequence for our Year 4 students focusing on the properties of odd and even numbers. The aim of this lesson sequence was for students to experiment with adding (and subtracting) odd and even numbers to form generalisations about the properties of odd and even numbers. What is supposed to be a two-lesson sequence with a teaching time of one hour for each lesson, ran for double that – such was the engagement of our students in the tasks. Before starting this lesson sequence, we had worked on place value, touching briefly on odds and evens. The first lesson had students adding a series of numbers as they passed through a 5x5 grid maze, and they needed to finish with an odd total. We asked our students to record their total and the number of odd and even numbers they passed through. The students worked on this for 20 minutes, before sharing some of their sequences. 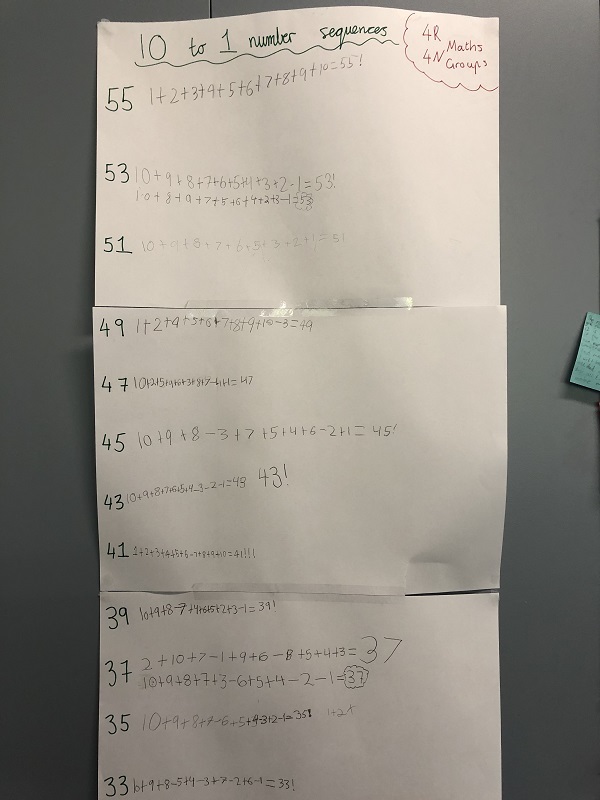 As we tallied our list, some students started to generalise, stating that to get an odd total we needed an odd number of odds and evens (for example, three odd and three even numbers to make 73). We sent the students back again and asked them to test this theory and asked if anyone could find a case where this isn’t true. Suddenly, a pair found a sequence through the maze that had an even number of odd numbers and another pair found another sequence with an even number of evens as well. So, we had to re-evaluate our generalisation. We came back to the floor and allowed these students to share what they had found and add their sequences to our growing list. We then challenged the students to discuss what they could now see and make a generalisation. At this point around half our students had a solid understanding, but not everyone. However, we moved to the second lesson in the hope it would make things clearer. The second lesson is called ‘10 to 1’. It challenges the students to either add or subtract all the digits from 10 to 1 to reach a specified total. My teaching partner and I encouraged the students to make 27, 15 and finally 12. The students began in pairs making 27. Some got 27 quickly, others had trouble and we encouraged them to keep persisting and try new strategies. We checked their sequences and the students moved onto 15. By the start of the next lesson, a few groups were working to finish with a total of 12, however, using the number 10 to 1 makes this impossible. Students kept getting 13 and 11, but getting 12 was proving difficult. It was at this stage I sat down with a couple of students and suggested maybe getting 12 wasn’t possible? They’d had half a dozen attempts so had certainly tried. I said if 12 wasn’t possible how could they prove it and to start thinking about the numbers they were using, how many odd, how many even. This is when the lightbulb moment came and they suddenly clicked onto why it was impossible. At this point, we stopped the lesson and regrouped to allow the students to try and explain why getting the answer of 12 was impossible, which ended our session. The next day we asked the students what numbers we could make, they soon suggested all the odds from 1 to 55, so challenged them to prove it. In pairs the students chose a number and then set about finding a solution for it. Every pair contributed to at least one number, some more. To conclude the session our Assistant Principal came down and the students explained what they had been doing. They talked about their strategies such as starting with the higher numbers first because it’s easier to manipulate the lower numbers last to get to their target number. 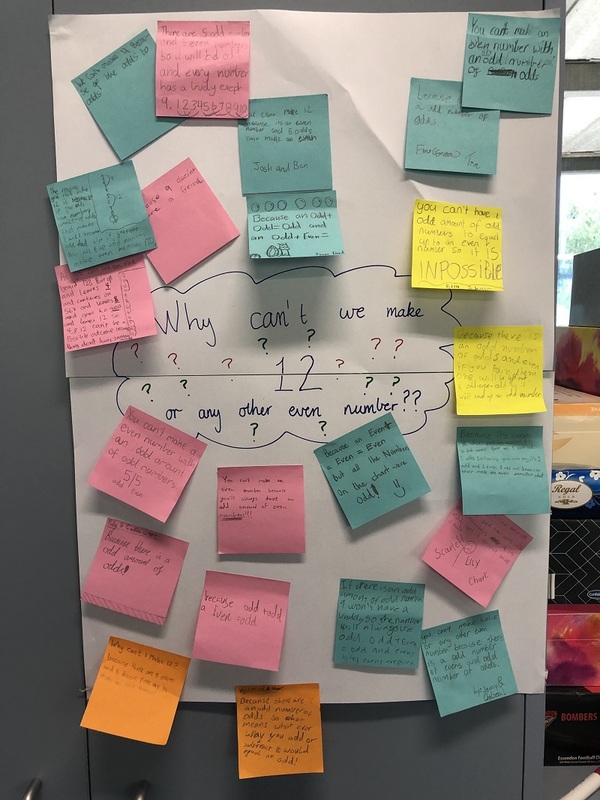 Then we finished by posing a question, ‘Why is 12 or any other even number impossible?’ The students took a sticky note and explained their reasons. This was a powerful way to finish the sequence and showed their understanding. We had some great responses like ‘because there is an odd number of odds’ and my favourite ‘because 9 has no friends’, which came from the idea of making even numbers of the odds by adding 1+3 and 5+7, but 9 hasn’t got any odd numbers (or friends) to join up with to make himself even. The lesson sequence was a lot of fun. The students thoroughly enjoyed the challenging aspects of the lesson and learning to persevere by trying new things when it doesn’t work out the first time, but most importantly learnt a lot. It was a really fun lesson sequence to teach and was my teaching partner’s first experience of a reSolve lesson and she’s already asking when we are doing another. reSolve as a resource is great. It’s not your whole curriculum, but something different you can add to complement your maths once or twice a term. The reSolve teacher resources are freely available for classroom teachers. The most important statement in this article is the final line: “[reSolve is] .... not your whole curriculum, but something different you can add to complement your maths once or twice a term.” Difficulties arise when teachers think that inquiry maths means that you no longer need to involve children in developing basic number skills to a high level of automaticity.